I spent June 12-18, 2011 at Otter Bar Lodge in Northern California. While the primary purpose was to learn to whitewater kayak, it was also a great trip to focus on my IM training. 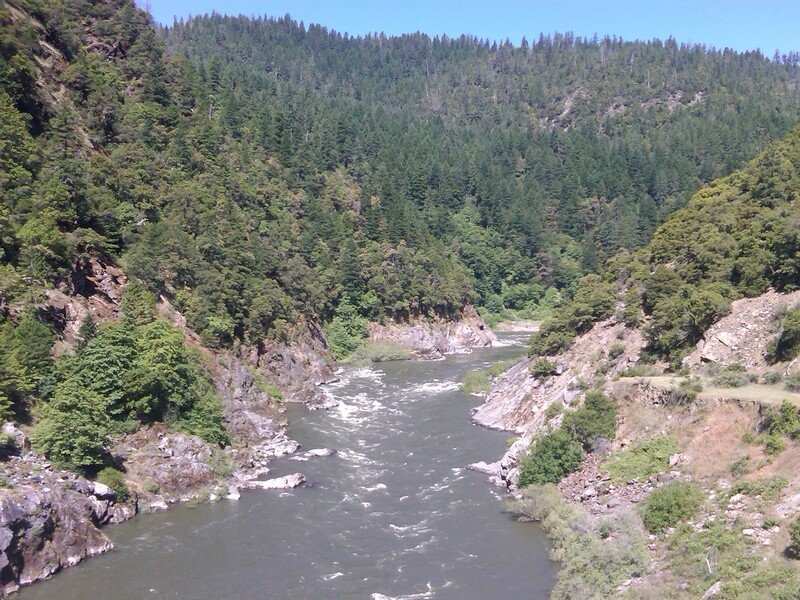 In addition to paddling on the California Salmon river each day, I also squeezed in a number of rides and runs in the Klamath National Forest. Thurs: 40 min run, AM pond, PM river – all the way back to the lodge! Fri: 20 mile ride, AM Pond, PM river – all the way back to the lodge again! Wednesday’s bike ride was incredible. I rolled out on the one lane road that leads to Otter Bar and headed down river towards Somes Bar. The road twists and turns for at least 8 miles, hugging each bend in the river, with absolutely no shoulder – just a straight drop down to the river on one side and crumbling rocky boulders on the other side. I came head to head with a small fuel truck at one turn, but he didn’t seem surprised to see me. I was thankful to be on a two lane road by mile 10 of the ride. At Somes Bar, I dropped down behind the general store to take the Ishi Pishi road over the Klamath river down to Orleans. Bob, the lodge’s massage therapist, former pro cycling team mechanic and avid cyclist (he rides his bike from his home to the lodge every day on that crazy one lane road! ), recommended the route. Below is a view from the bridge. It was a long, long climb – followed by a terrifying descent that made my hands and shoulders hurt from clutching the brakes for so long. I cycled back to Somes Bar along Highway 96 and stopped at the general store for a well deserved ice cream (and chat with the locals). Often in training, we talk about the heat index on a ride or a headwind that makes a 40 mile ride feel like 50. So, after this 50 mile ride around the Klamath National Forest and Six Rivers National Forest, I couldn’t help but wonder how many miles I could add on to the ride given the fear index? If you factor in the fear of the one lane road, the fuel truck, and the terrifying descent to Orleans, my ride must have been more like 60+ miles, right? Categories: IMCanada, training, travel | Permalink.